Microwave dielectric materials play a key role in our global society with a wide range of applications, from terrestrial and satellite communication including software radio, GPS, and DBS TV to environmental monitoring via satellite. A small ceramic component made from a dielectric material is fundamental to the operation of filters and oscillators in several microwave systems. In microwave communications, dielectric resonator filters are used to discriminate between wanted and unwanted signal frequencies in the transmitted and received signal. When the wanted frequency is extracted and detected, it is necessary to maintain a strong signal. For clarity it is also critical that the wanted signal frequencies are not affected by seasonal temperature changes. In order to meet the specifications of current and future systems, improved or new microwave components based on dedicated dielectric materials and new designs are required. The recent progress in microwave telecommunication, satellite broadcasting and intelligent transport systems (ITS) has resulted in an increased demand for Dielectric Resonators (DRs). With the recent revolution in mobile phone and satellite communication systems using microwaves as the propagation media, the research and development in the field of device miniaturization has been a major challenge in contemporary Materials Science. In a mobile phone communication, the message is sent from a phone to the nearest base station, and then on via a series of base stations to the other phone. At the heart of each base station is the combiner/filter unit which has the job of receiving the messages, keeping them separate, amplifying the signals and sending then onto the next base station. For such a microwave circuit to work, part of it needs to resonate at the specific working frequency. The frequency determining component (resonator) used in such a high frequency device must satisfy certain criteria. The three important characteristics required for a dielectric resonator are (a) a high dielectric constant which facilitates miniaturization (b) a high quality factor (Qxf) which improves the signal-to-noise ratio, (c) a low temperature coefficient of the resonant frequency which determines the stability of the transmitted frequency. During the past 25 years scientists the world over have developed a large number of new materials (about 3000) or improved the properties of known materials. About 5000 papers have been published and more than 1000 patents filed in the area of dielectric resonators and related technologies. This book brings the data and science of these several useful materials together, which will be of immense benefit to researchers and engineers the world over. The topics covered in the book includes factors affecting the dielectric properties, measurement of dielectric properties, important low loss dielectric material systems such as perovskites, tungsten bronze type materials, materials in BaO-TiO2 system, (Zr,Sn)TiO4, alumina, rutile, AnBn-1O3n type materials, LTCC, ceramic-polymer composites etc. The book also has a data table listing all reported low loss dielectric materials with properties and references arranged in the order of increasing dielectric constant. 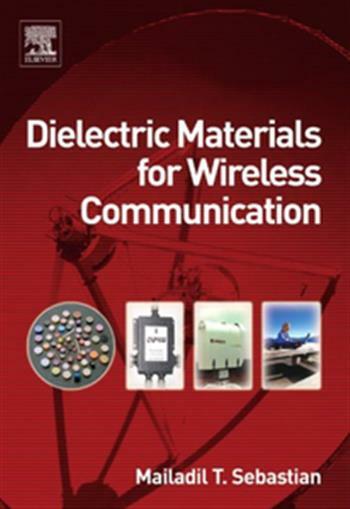 Dielectric Materials for Wireless Communication Fast Download via Rapidshare Hotfile Fileserve Filesonic Megaupload, Dielectric Materials for Wireless Communication Torrents and Emule Download or anything related.